A family business and farm for generations, Thomas Thomson Ltd grew raspberries for processing as well as spinning flax and jute in mills powered by the River Ericht. The farm lies close to the centre of Blairgowrie, the historic centre of raspberry growing in Scotland. As the UK jute, flax and processing berry industries diminished Peter Thomson adapted his farm to growing raspberries and strawberries for the fresh market. He started to supply supermarkets through the Berry Gardens co-operative in 1985 and expanded the area and the range of crops grown substantially. Recently Peter has focussed on blueberries, cherries and the more unusual aronia berries. 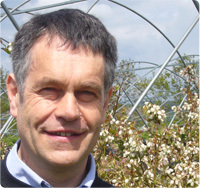 Peter Thomson is a great innovator taking part in a number of research projects under the LINK and InnovateUK schemes. He runs a packhouse for his own and other members’ fruit.